All work and no play make Americans sick according to a study of 632 people by Oxford Health Plans that found 1 in 5 workers can’t use up annual vacation time because their jobs are so demanding. 33% never leave their offices once they arrive at work and that same number work and eat their lunch simultaneously and the pace of work is so relentless that 34% say they never have downtime. Taking a vacation for creative renewal is essential to staying healthy and productive, although the US gives the least vacation time among the industrial nations. (US – 13 days vs. Italy – 42 days). Your work space may be telling on you. An IOGEAR survey found that 73% of respondents said their impressions of colleagues were influenced by the way their desks were organized and 70% said a messy desk was perceived as less career driven. Tired of being tired – sweep away eyesores to release energy. 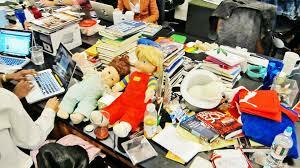 Every messy pile has a negative force field around it that draws energy and deleting the clutter releases the energy. Down in the dumps – lift items off the floor to feel happier since low-lying items attract low, sad energy. Find a higher space to store things to elevate your mood. Slim down with less stuff – subconsciously we may be holding onto stuff the same as we are holding onto our extra weight – to protect ourselves and feel less emotionally vulnerable. Try shedding some outdated sentimental items that were once treasured and are now clutter. It’s Spring Cleaning time and you get the benefit of culling through the stacks of articles and information I’ve accumulated over the years. American Express Incentive Services commissioned a survey of employees to see what they wanted in a reward. They found that 62 percent wanted the freedom to choose their own reward. They wanted a say in what they received in the manner of gift cards where they could use them for a dinner out, new CD’s, DVD rentals, a BBQ set, new shoes, movie tickets, or whatever else that suited them at the time. So say goodbye to plaques and hello to pre-paid gift cards that have multiple uses. If you are tired of meetings where nobody is contributing their share of solutions to the day’s challenges, then tell them that their admission ticket to the next meeting will be an index card with an original idea or their take on a solution to a pre-stated challenge written on it. Collect the tickets at the door and start the meeting by reading each card to the group to generate more active participation and engage them. Did you know that compared to the 1970’s, people today work 20% longer hours and have 32% less leisure time? In the past 30 years, psychologists estimate that workplace stress has doubled – along with the increase in stress levels of mixing business with family matters. A survey by careerbuilder.com revealed that 60% of the nation’s workforce finds it difficult to be professionally successful and sufficiently involved in family/social life. Over 74% said tele-work is the most desired perk, and 49% said they deliberately sought out flexible work environments during their last job hunt. What are you doing to help your workers balance their personal and professional lives? In the spirit of getting along in the workplace and increasing understanding between Generation X, Boomers, and Traditionalists, here are some sites that give some insight into “What the heck do they mean and why on Earth are they acting that way?”. Research from ComPsych – the world’s largest employee assistance program provider shares their recent findings on employee stress at work. 48% of workers report high levels of stress mixed with extreme fatigue and a sense of feeling out of control. Among that 48%, there were 41% who cited their workload as the culprit, 31% said it was people issues, and 28% of those with high levels of stress said it was juggling work and personal life that stressed them out so much. The next group of workers, 38% cited they experienced constant, but manageable stress levels, and 14% said they had low stress levels. What are you doing to manage your stress levels or those of your team so they will be more gruntled and less disgruntled and grumpy? According to CCH, Inc. – an HR research firm, the Unscheduled Absence Survey found the number of employees missing work for personal reasons has increased to 21% from 11% last year. Of the 333 human resources executives surveyed, personal illness was cited 33%, with 67% absent due to personal reasons resulting in a cost of $789 million. The study found that an increase in morale significantly lowers the number of absentees. Organizations with good overall morale has a 1.9% absentee rate while others averaged 2.4%. The more options employees have, the better the morale and the lower the absentee rate. Two of the major things to do this are provide more flexible time off and offer more work/life programs such as childcare, working from home or compressed work weeks. A “new” way to recognize employees: ask them to participate in an important project they might not otherwise work on. Using involvement to reward workers tells them that you value their performance and it provides you with a pool of creative thinkers. Beat the turnover odds: in the fast food industry with turnover rates close to 100%, one owner explains his staff longevity of 8-10 years at a Chick-Fil-A is due to his treating them like customers and greeting them daily, talking to them throughout the day, and saying good-bye when they leave. Talking to them -what a concept! No excuses for where you have been. Start from where you are right now and make positive changes toward increased energy. Select a few strategies that seem most workable for your lifestyle and make adjustments from there. It’s never too late to make a difference in somebody’s life – even your own. You don’t have to wait for that proverbial wake-up call such as a heart attack, cancer, a stroke, termination, divorce, children going off to college, or death of a loved one; you can decide to change now. We either take what we get or ask for what we want and have some influence over what we want. Waiting around for fate to make our decisions doesn’t give us much of a back-up plan or wiggle room to move towards what we want. So what are you waiting for? Where do you want to go? What steps do you have to take to move forward in the direction and the end state that was mentioned earlier? Each day is the dawn of a new beginning and a chance for each of us to start fresh and use our past experience as feedback and not an excuse. Start today to create what you need to energize yourself and your life. Don’t drown yourself in the negative energy of what happened to you in your past or the energy drain of feeling like a victim from your past experiences. Quit the bad habits that are draining the life out of you, or may have been holding you back, or may have lead you to a negative place in the past. No excuses. Just do it because you know what these habits are and you know it’s the right thing to do. I know it’s hard; but the benefits of long-term satisfaction will far outweigh the short-term gratification. Get yourself together, get your partner, get a friend, or get professional assistance to help you quit the bad stuff for the long haul. Just do it. While you’re at it, quit procrastinating and move on to newer and better things. 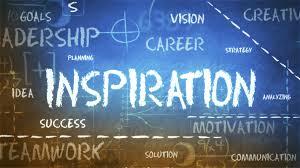 Getting the inertia moving in the right direction towards more positive things helps bring energy into our lives. Take a fresh look at what you have today and where or who you want to be tomorrow and focus on what you need to do right now to start down that new path. Just do it.
! : Live Your Life as an Exclamation! Remember Helen Keller’s statement, “Life is either a daring adventure or nothing at all.”? Live your life out loud, as if you didn’t have much more to live . . . because you never know what the future holds. It takes concentrated effort to avoid being lulled into our secure patterns. How would you change your behavior if you knew you would live to be 100, or for only a few more years, or months? Because our life can change dramatically in a matter of moments, live and laugh loudly now. What have you been excited about lately? Make dates with yourself to stretch your comfort zone. By taking calculated and thoughtful risks, we put ourselves out there to trust our intuition and to go with our gut instincts. As we grow older, we tend to risk less and live more quietly. Be daring and buck this trend by learning a new sport, a new language, a new art form, or renting a Porsche 911 and driving the autobahns of Germany. A trend sweeping the nation lately is the Red Hat Society where women of a certain age (mid-centurions) don purple outfits with red hats and get together to test drive new experiences, kick up their heels, or just have a fun outing. Check out www.redhatsociety.com for more information on these wild and crazy women and their forays into living life as an exclamation. Word has it that if you are under the age requirement, you can join in the festivities, but you must wear lavender apparel with a pink hat until you have earned your stripes and are old enough to be promoted to the proper colors. Adventure gets your adrenaline pumping and charges you up. There’s nothing like a good adventure to narrowly focus on the task at hand and take your mind off trivialities. Excitement builds commensurate to the physical, emotional, intellectual, or financial risks being addressed. Push yourself to taste adventure more often as it will boost your energy and make you feel alive. Adventures come in all shapes and sizes from taking a new route to work, to learning a new computer program, taking a cooking class, or walking into a singles bar alone. What constitutes an adventure is really in the eye and the attitude of the beholder. Wearing a bikini might be common practice for some, but for others it might be an adventure, or perhaps a misadventure. It doesn’t have to be exotic or life threatening to be an adventure. Deciding to have an attitude of an adventurer and being open to what comes your way will help you deflect some of the stress that may come your way when things don’t work out as planned. At least you will have an adventure to tell friends and family about later. What have you done lately that could be considered an adventure? Why not plan for some adventures on your own as well as with friends or family? You never know where your next adventure will take you. I have a ritual that I need to try at least one new big adventure each year such as hang gliding, sky diving, helicopter skiing, or dog sledding. It keeps my energy up just looking forward to the thrill. What is your next big adventure? Keeping our sense of adventure and discovery in tact helps keep us on track. Cultivating our sense of delight and honing it by introducing new and enjoyable experiences into our lives helps to keep us feeling vital. Children are naturally adept at these traits since their lives are filled with copious amounts of discovery and delight because they have not yet discovered many life experiences and everything is still new and exciting. As adults we tend to stay with what we know and our discovery cycle diminishes with age. To keep ourselves young, try doing what the young people do and make new adventures and discoveries a part of your lifestyle. Keep your curiosity up about how things work, why things are the way they are, and what happens if. . . By putting yourself in the position of life-long learner, your energy will be renewed with each aha moment or new discovery. Risk Taking and stretching out of our comfort zone physically, mentally, or emotionally keeps us on our toes and gets our adrenaline and our energy surging. They key is to move that energy towards the excitement end of the continuum versus the nervous and “scaredy cat” end of the continuum. Whether it’s embarking on a new career, asking for a raise, auditioning for a spot in a theatre production, walking into an adult education class, or a weight room; the act of going beyond our normal limits expands our world and expands our possibilities while it expands our energy level. Without such regular expansions, we cease to be vital in our lives and begin to live the same day over and over again. Open yourself to new discoveries and see what new energy reserves are released. It is often uncomfortable to try new things and risk feeling foolish or not being good at a new sport or artistic endeavor or even test driving a new recipe. When we put ourselves out there to try new things and take a risk, we increase our energy and our thirst for exploring new things and trying new ways of being or behaving. Try planning for small, medium, and larger risks each year to keep your life more interesting and see where in the world it takes you. Taking calculated risks and not throwing all caution to the wind and taking stupid risks whether it’s physical, financial, emotional, or intellectual is probably a good idea. Only you know your risk tolerance in each of these areas and only you know how much of a nudge you need to expand your tolerance. So go ahead and take a leap of faith, I dare ya. Your body doesn’t know the difference between real and imagined things. It only knows what your brain tells it, so make sure your brain is telling your body positive things. A positive state of mind has been known to cure diseases, prevent sickness, or prevent a worse condition as evidenced by the research by Norman Cousins in The Anatomy of an Illness. You can wake up and decide to have a happy day or a deliriously happy day . . .or not. Choose your vocabulary and self-talk wisely. The use of certain words can trigger physiological responses that can cause high blood pressure, stress, and other negative reactions. The power of positive thinking guides your behavior, which in turn guides your future. When you change your mind, you change your energy, and when you change your energy, you change your life. We can also change the energy of the people around us as our energy is contagious and we are part of other people’s environments just as they are a part of ours. Be aware of the company you keep and how their thoughts and behaviors are affecting your energy. These positive thoughts also refer to the music you listen to, the books you read, or the movies and TV programs you watch. Be aware of the negative or positive messages your body is receiving from internal or external sources and be thoughtful of what you choose. Your attitude, whether positive or negative is everything. It’s how you view the world and how you react to the world. It also affects how the world reacts to you. Your choice of attitude can bring you up, up, up, or down, down, down. Attitude is what draws people towards you or repels them against you. Do you think anybody wants to hang around a crabby person? Have you ever paid attention to the negative energy of a worrier or somebody who is always sick or thinks they are sick or about to be sick? You can feel the negative energy emanating from their very being. No matter what the situation, we always have a choice about our attitude. Positive attitude and enthusiasm are the secret weapons of successful people. Make a conscious effort to choose happiness and a positive attitude, and watch the positive repercussions stem from a resourceful state of mind. Your attitude really is contagious and we have a choice as to whether we want to infect people with our bad attitude or affect people with our good attitude. It not only changes our energy, but the energy of those around us. Remember, when we change our mind, we change our energy, and when we change our energy, we change our life. What are you doing to make the right choice of attitude? If you notice that your partner, your family, or all the front-line service people you encounter are being especially cranky to you on a particular day, take notice of how your attitude might be rubbing off on them. We generally mirror back the same energy that is projected towards us. Matching energy is one of those things we do subconsciously and once we are aware of it, we can make it work to our advantage. All behaviors (except autonomic responses) begin as thoughts. Make yours positive. How about sending positive messages around the world in the form of greeting cards and gifts. Your words of appreciation can provide you with a way to make a living through giving. Take the Gratitude Challenge by sending 30 cards in 30 days to those who need to hear kind words from you – try it out at www.SOCGratitude.com/9431 with the Send Out Cards system. Research has shown that those who wake up with a jolt to an auditory-assaulting alarm start out their day agitated. Add in the usual frantic rush to get out of the house and we get weary before we get to our destination. We often run on the temporary burst of energy from adrenaline or the stress hormones produced in the fight or flight response, instead of authentic, long-term energy. Compare that frazzled episode to awaking on our own to our body’s natural rhythms after a good night’s rest, or to pleasant music with plenty of time for morning activities, most of which has already been prepared the night before. Ease into your day, start off on the right foot, and make the first hours as pleasant as possible. If you must use an alarm, try a Zen Alarm clock that starts out very quietly and grows to a slightly louder volume or an alarm that has other soothing sounds of soft music or nature. Try listening to calming music instead of the morning news, taking a morning walk to clear your head, and plan the day sipping herbal tea on the deck, or practicing yoga to start off in the right frame of mind. Gulping coffee, slamming down a donut and dashing out the door combing your hair is no way to feel good about yourself. Ingesting caffeine causes our body to run like an engine revving to 70mph in second gear. It will move, but it’s not natural and it can’t keep up that pace without negative repercussions. To get a jump on stress, ditch the coffee and the caffeine that has been found to elevate your blood pressure throughout the day and into the night. Caffeine exaggerates the stress response and the affects last for 8-10 hours. Stress hormone levels were double that of those who were not ingesting caffeine in one study done at DukeUniversityMedicalCenter. If you must sip a hot beverage, try herbal tea, green tea with its anti-oxidant factors, or rooibos tea which has even more anti-oxidant power than green tea and both have much less caffeine than coffee to avoid the highs and lows that coffee can bring on. Decaffeinated teas are also available. Make sure to look for those brands that are naturally decaffeinated and not chemically decaffeinated for the most healthful choice. There are numerous studies about the positive affects of these teas such as helping us fight against cancer and preventing heart disease by helping lower our cholesterol. Why not try sipping hot water with lemon instead of coffee to help cleanse your system. Another great starter is an energy shake made with fruit, yogurt, tofu, milk, wheat germ, and juice to get your protein, carbs, fruit, fiber, and dairy in your system in an easily digestible form. Fill your day with energy inserts, short breaks, breathing room, downtime, toys, and playful items that speak to you and that are appropriate or allowed in your workplace. Studies show that using colored pens, stickers, and getting creative will cause you to look forward to your daily planning sessions. When we plan our time better, we usually have more time to insert some energy into our schedule. Turn your planner into an adult version of a coloring book and color-code your schedule to quickly see how balanced or unbalanced your life is. With a quick glance at your colorful calendar you can see immediately which color dominates or if they are in balance. Our eyes see color before they see words, so using different colors for personal, professional, meetings, deadlines, or other categories will save you time and eyestrain from reading all your activities. Plotting both personal and professional time slots in your palm pilot or day timer will help you schedule your day and keep you from becoming overscheduled, over-committed, and overwhelmed. Recognize that you will need some downtime for your brain or your body after a taxing project and schedule the downtime into the project planning time. Insert pleasurable things into your day to help you practice safe stress and mark it on your calendar. Some clients have a family calendar on the refrigerator and use a different color for each family member on the master calendar for easier planning. Professionalism can be playful – remember fun and effectiveness? Energy inserts could be candles, flowers, juggling, music, people, pets, art, free time, fresh air, or anything else which makes your smile or nourished your soul. Create your Fun Meter list and write down as many things as you can that make you smile and that you enjoy doing in your leisure time to practice safe stress. Taking several joy breaks daily can liven up your life. Look at photos, stretch, call a friend, turn on music, have fresh flowers, walk outside, or move your body to release the tension and get your left and right brain integrating more effectively. Research shows that those who plan for daily joys can cope with stress much better than those who don’t. Become aware of what brings you joy and create moments in your routine to experience aspects of that positive feeling. Just thinking about joyful things brings positive physiological and psychological changes in your body. Joy is a step beyond happiness; it is more active and animated than plain happiness. What joyful things are you putting into your life as an energy insert today? See Appendix A for more energy inserts to get you started on your own list. If you have trouble wondering what to do with an extra 15 minutes in your day, keep your list handy and start inserting some energy and joy into your day.